The routes in this book are a mix of Himalayan classics such as Manali to Leh in Ladakh and the Friendship Highway (Lhasa to Kathmandu), as well as rides in lesser-known areas such as Sikkim and Bhutan. Other routes, while legendary, are less pedalled such as the Karakoram Highway which snakes between northern Pakistan and western China. Some routes in this book have no proper name but are nicknamed by their start and end points or by the region that they travel through such as Spiti. Some simply have no label so are named by the state or country they're in, as with Sikkim and Bhutan. For pure mountain scenery the Karakoram Highway ('KKH') through Pakistan's Northern Areas is unsurpassed. Mountains such as Nanga Parbat (8125m/26,656ft) and Rakaposhi (7788m/25,551ft) seem almost to touch the road while their peaks soar more than six thousand metres above it. From the Friendship Highway Everest's North Face is not much more than a white pointy peak on the horizon but is an awe-inspiring sight from Base Camp, a five-day detour. Sikkim and Bhutan are both lower in altitude with routes plunging to below 500m but what they lack in sheer altitude they make up for with hills! Three of the routes above cross the Great Himalaya range: the Manali-Leh Highway at Baralacha La (4918m/16,135ft), the Leh-Srinagar Highway at Zoji La (3545m/11,630ft) and the Friendship Highway at Yarle Shung La (5140m/16,863 ft). The trans-Tibet routes from Kashgar to Lhasa and on to Zhongdian are the two highest routes, offering more 5000m passes than anywhere else in the world. The Karakoram Highway skirts the westernmost bastion of the Himalaya between Gilgit and Tashkurgan, crossing into China at the 4695m Khunjerab Pass. Sikkim and Bhutan both lie to the south of the Great Himalaya range in the Himalayan foothills. If culture and religion are a factor in choosing where you go the KKH passes through predominantly Islamic areas in both Pakistan and China; routes into and out of Ladakh blend Hinduism (Himachal Pradesh), Buddhism (Ladakh) and Islam (Kashmir). Bhutan and Tibet are both Buddhist; Sikkim is Hindu and Buddhist. Pakistan is the most conservative of all these areas while Bhutan is arguably the most relaxed. Safety is as much a concern in Kashmir and Assam (the exit point from eastern Bhutan) as it is in Pakistan, especially for solo women travellers; keep up to date with the news if you plan to visit. All these routes can be ridden in their entirety except the KKH. Since 2001 the Chinese authorities have forbidden unescorted travel between the Khunjerab Pass and Tashkurgan. In practical terms this means cyclists are put on a bus between Sost in Pakistan and Tashkurgan, lopping a couple of hundred kilometres off the ride. The difficulty rating given to the rides (in the book on page 9) is relative to the Himalaya: none of these rides can be described as a Sunday afternoon pedal along a towpath but if you're up to the challenge this really is landscape to inspire and enthral you. Because these rides are tough, training will ensure you're fit enough to enjoy the experience. The difficulty rating is based on a loaded bicycle with heavy panniers; anyone carrying little or no luggage will find the rides much easier. If you're short of time another factor is how long it takes to reach the start point. Obtaining visas can also have an influence on your itinerary. If you're travelling overland note that it can be difficult to pick up visas for Pakistan (especially in Iran). If you're already in Nepal be warned it's often impossible to enter Tibet except on an organized jeep tour; better to approach Tibet through a mainland Chinese city such as Beijing or Chengdu. it's currently impossible to enter either Tibet or China from India. Similarly, your nationality may restrict where you can travel; for example Israeli citizens cannot enter Pakistan. See the first page of the individual route chapters for overviews of the routes. No mountain road is ever going to stay in good shape for long but some are definitely worse than others. The KKH is generally tarmac but prone to landslides from Gilgit northwards in which case you may find yourself carrying your bike over loose rockfalls. The Chinese resurfaced their side in 2005 so once past Tashkurgan the surface is excellent but in 2006 China and Pakistan agreed to upgrade the KKH by trebling its width: if this work goes ahead road conditions will become unpleasant during construction. Manali-Leh is generally tarmac too but with seasonally bad sections on the passes; Baralacha La is often a trouble spot and streams can wash out bridges after heavy rain. 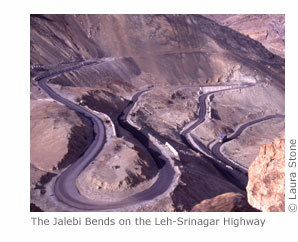 Leh-Srinagar is mostly excellent tarmac as this is a vital military route. Spiti is awful for the first 100km; after that it's good tarmac until Kinnaur which should have excellent tarmac but is prone to landslides as well as flooding from the river Sutlej. Such landslides can usually be crossed on foot and washed away bridges will sometimes be replaced by a pulley system on which people and bicycles can be winched across. Sikkim has good tarmac roads except in the restricted area around Gurudongmar Lake in the far north. Chinese road crews have been resurfacing the Friendship Highway since 2003; at the time of writing the only section left to tarmac is between Tingri and the Nepali border. The worst section of this is the massive 1300m descent from Nyalam to Dram on loose stones churned up with mud if it's been raining. Bhutan has the best roads in the Himalaya – perfect tarmac and little traffic east of Thimphu.